Secured funding and partners to produce various wayside interpretive panels throughout Frederick area. Many contain commissioned original illustrations by local artists. These include markers depicting historical places such as Mount Olivet Cemetery, the Historic Frederick (Hessian) Barracks, B&O Railroad vs. C&O Canal, Mary Quantrill, Mason & Dixon Expedition, 1765 Stamp Act Repudiation, and Confederate Row. My role involved research and writing of content, finding appropriate illustrations and providing guidance and oversight with original artwork..
Large history mural wall featuring a chronological overview of the 19th century from the county's earliest organized cattle shows of the 1820's up through agricultural exhibitions that grew in scope to Frederick having the largest county fair in the state. Today it is one of the largest in the country. This project was sponsored by the Great Frederick Fair in commemoration of their 150th year (2012). The project was produced as a fabric tension frame and remains on display in the GFF's Null Building east foyer. I was responsible for the content (research, writing, illustrations) and design work was done by Jennifer Hankey of HDI Corporation. Fabrication work by Imagination Center. Packaging and marketing the "Maryland's Heart of the Civil War" film. An Emmy® award-winning historical documentary, this comprehensive film introduces viewers to the compelling heritage stories and tourism opportunities in the central Maryland area. Wrote and directed layout of accompanying 16-page commemorative booklet and Heart of the Civil War Heritage Area brochure-map guide. Project manager. Developed, secured funds, research, wrote, illustrated 3-sided upright wayside exhibit kiosks for towns associated with the C&O Canal Towns Partnership (Brunswick and Point of Rocks, MD) and Catoctin Mountain Towns (Emmitsburg and Thurmont, MD). Design and fabrication by Hopewell Industries. 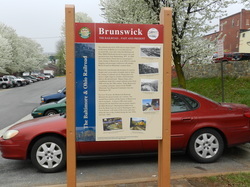 Assisted City of Brunswick with researching, writing, illustration search for other upright markers funded by Maryland Heritage Areas Authority and the Recreational Trails programs. A 1.5 hour documentary focusing on Maryland's Piscataway Indian Tribe at the point of contact with White Europeans, and the extensive fur trade network and work of early explorers in the first century of the colony. Other figures explored in this documentary are Swiss Baron Christoph Von Graffenried (founder of New Bern, NC), French-Canadian fur trader Martin Chartier and theTuscarora Indian Tribe. Developed, produced, researched, wrote, shot and edited this documentary, broadcast on Cable Channel 10 in 2000 and redistributed for resale. Procured funding to develop and install several interpretive exhibits within the Maryland Welcome Center located at Emmitsburg, MD along US15. Hired a "Dream Team" including: Interpretive Direction, Ion Design Works, General Graphics, Inc. to perform design and fabrication/installation work. My duties included overall project management and constructing/oversight of vendors and design planning team (of stakeholders). Served as liaison between partners (Tourism Council of Frederick County, MD Office of Tourism Development, State Highway Administration and Grant Authorities (National Scenic Byways and Maryland Heritage Areas Authority). Formulated themes, researched and wrote content, found illustrations and guided artist in original depiction of Mason and Dixon Survey for the project. A series of bronze medallions placed within sidewalks throughout Downtown Frederick. These feature noted quotes and passages from Frederick's past. Assisted Downtown Frederick Partnership with researching and providing appropriate quotes and visuals for this project. Developed, researched, wrote and illustrated a Series of 10 wayside markers found in Downtown Frederick. These include cultural and heritage tourism information regarding unique site locations, personalities, businesses and attractions found here. Co-managed project design-fabrication by Merje Design. Research on the authenticity of the actions of Frederick heroine Barbara Fritchie, who posthumously earned international fame due to John Greenleaf Whittier's famous poem entitled: The Ballad of Barbara Frietchie. Through my work, writings and lecture presentations, I have shown the pitfalls of this legend, while giving credence to the actions of neighbor Mary Quantrill, who should have been credited with heroism during the Confederate occupation of Frederick in September, 1862. "The Other Flag Waivers" lecture (first given at the Frederick Historical Society June, 2012 to open the exhibit entitled "The Fritchie Phenomenon: Barbara Fritchie in Popular Culture"
This illustrated Power point lecture continues to be presented. Produced by filmmaker Chris Haugh and the Tourism Council of Frederick County, Inc., in partnership with the Thurmont Historical Society, this 3.5 hour documentary was 20 years in the making and features an entertaining group of on-screen commentators, vintage photographs and striking video scenes. Viewers are introduced to a colorful history dating back to the mid 1700’s, carefully tracking the eventual formation and rise of the northern Frederick County town of Mechanicstown, known more commonly today as Thurmont. Produced, developed, designed, researched, wrote, shot, interviewed and directed editing. Asked to write the Foreword for Frederick County Characters, an intriguing book by friend and fellow Frederick historian, researcher and writer John W. Ashbury. Developed, researched, wrote, illustrated and managed this project after procuring necessary grant funding.There are hundreds of miles of paved roads in Frederick County, many excellent for bicycling. The Heritage Bicycle Tours brochure and the Frederick History Bicycle Loop brochure offers cyclists a way to discover the area's rich history and scenic landscapes. Heritage Bicycle Tour Routes. The Heritage Bicycle Tours brochure features five distinct tours that have their own unique experiences. They include: City of Frederick Civil War "Campaign Ride," "North County Bridge Sampler," "Transportation Heritage Trail," "Catoctin Mountain Challenge, and Spirits of Burkittsville . Also assisted in creating, writing and vetting trail and history information comprising George Ruszat's Frederick History Bicycle Loop brochure/guide. Developed, designed, procured funding, researched, wrote and managed this project which was funded by a grant from the Maryland War of 1812 Commission (Star Spangled200) and the Francis Scott Key Memorial Foundation. 107 new bronze and granite markers were placed on the graves of 109 veterans of the War of 1812. Mt Olivet has the second highest concentration of soldiers in the state, many of which had not been marked before. 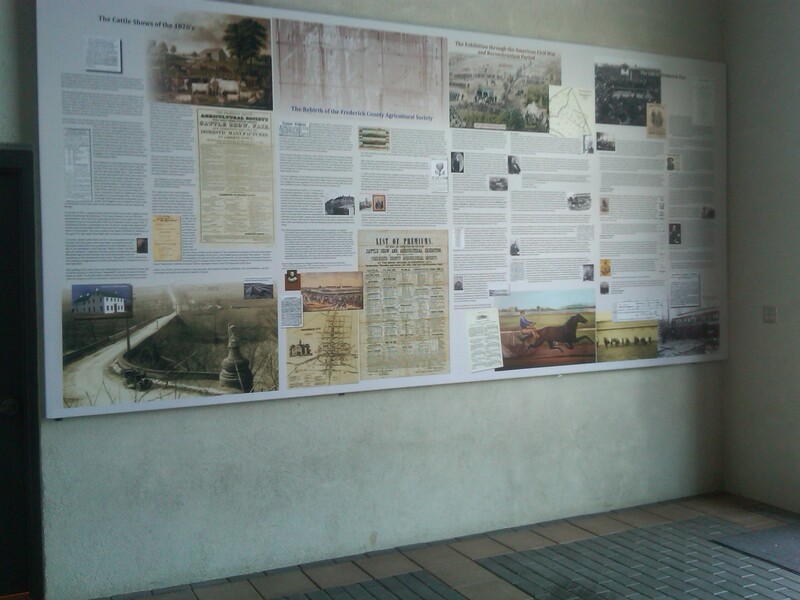 The project also included 4 interpretive waysides which were researched, written and illustrated by me. I was very proud to work with McCaskill Financial and the Frederick Woman's Civic Club in making this project a reality in helping educate visitors and tourists alike about Frederick's forgotten heroine Mary Quantrill, the true Barbara Fritchie. "Proposed, developed, wrote and managed a Mary Quantrill wayside marker in front of her house in Frederick at 120 West Patrick Street. Features a commissioned art piece by Richard Schlecht. Dedicated April 2015. Corridor Management Plan Implementation for this nationally designated byway, part of the America's Byways brand (FHA). All aspects of marketing for this important tourism product. Collaborated with MD State Highway Administration, government officials and local stakeholders along US15. Assembled and led volunteer Advisory Board. Grant Project writing, acquisition and management. Developed, researched, wrote and managed CMNSB brochure-guide project. Developed, research, wrote and illustrated wayside interpretive panels and brochure content for the Maryland Civil War Trails Program. Developed, produced, researched, wrote, shot and edited this 5.5 hour documentary focusing on the Black history of Frederick County, Maryland, a dynamic case study of "a border county within a border state." An award-winning video documentary that explores the achievements and struggles of local Blacks since the inception of Frederick County in 1745 up through Emancipation in 1864 and the Civil Rights movement 100 years later. *1998 Beacon Award of Excellence – Highest industry public relations honor presented by the Cable Television Public Affairs Association. Developed, designed, procured funding, researched, wrote and managed this project which was funded by a grant from the Maryland War of 1812 Commission (Star Spangled200) and the Francis Scott Key Memorial Foundation. 107 new bronze and granite markers were placed on the graves of 109 veterans of the War of 1812. Mt Olivet has the second highest concentration of soldiers in the state, many of which had not been marked before. I also created 4 interpretive waysides (research, wrote and illustrated) for this project. 2-hour video documentary that takes viewers on a 1.2 billion year journey to better understand and appreciate the cataclysmic events that shaped the present day landscape of Frederick County and the surrounding area. Explores the earliest life forms from marine organisms and dinosaurs to native-aboriginal man. Bite-sized portions of geology, meta-geography, biology, archeology, and anthropology are introduced along with Paleo, Archaic and Woodland Indian periods of travel/occupation. Developed, produced, researched, wrote, shot and edited this 2 documentary broadcast on Cable Channel 10 in 1999 and redistributed for resale. Emmy-award winning film produced by the Tourism Council of Frederick County in partnership with (MPT)Maryland Public Television. This film introduces viewers to the compelling heritage stories and places within Maryland's Heart of the Civil War Heritage Area (Washington, Frederick and Carroll counties). Featuring nationally acclaimed historians, authors and battlefield experts, the documentary also includes striking visuals and "feature quality" historic reenactment scenes. One of several brochure projects that I managed and was responsible for researching, writing, illustrating. Design/layout work done by Jean Peterson Design. Frederick County has three of eight remaining covered bridges in the state of Maryland. All three are still in use and can be traversed by vehicle, bike or by foot. Project Producer who researched, wrote and compiled this 348-page companion flipbook app for the award-winning "Maryland's Heart of the Civil War" film. The book is broken into 12 chapters and has interactive multimedia opportunities including audio and video clips from noted historians. The app can be downloaded for free from the Apple I-Tunes Store and GooglePlay. Desktop version Oversaw all aspects of design layout (vendor: Jean Peterson Design) and video production (Digital Bard Media). Frederick Visitor Orientation Film Executive Producer: Secured grant funding, developed design/concept, chose vendor for this 7-part, 15-minute interpretive film for the 60-seat theater within the Frederick Visitor Center. Duties: co-wrote script, arranged shooting locations, guided video production film crew and closely assisted project director and editor. Duties included additional historical research, writing and editing script, finding appropriate visuals, photographs and video clips. TCFC contracted with Metro Productions, Inc. (Richmond, VA). Frederick Visitor Center Planning and Design Team: Developed initial design for interpretive exhibits within the new Frederick Visitor Center (Frederick County, MD) owned and operated by the Tourism Council of Frederick County. Duties included historical research, writing and editing text, finding/creating appropriate visuals, photographs and video clips for illustration. TCFC contracted with Jackson-Brady Design Group (Washington DC). Mini Articles published in various tourism oriented magazines and guides. Mini feature article written for the Frederick County Community and Relocation Guide. Project manager. 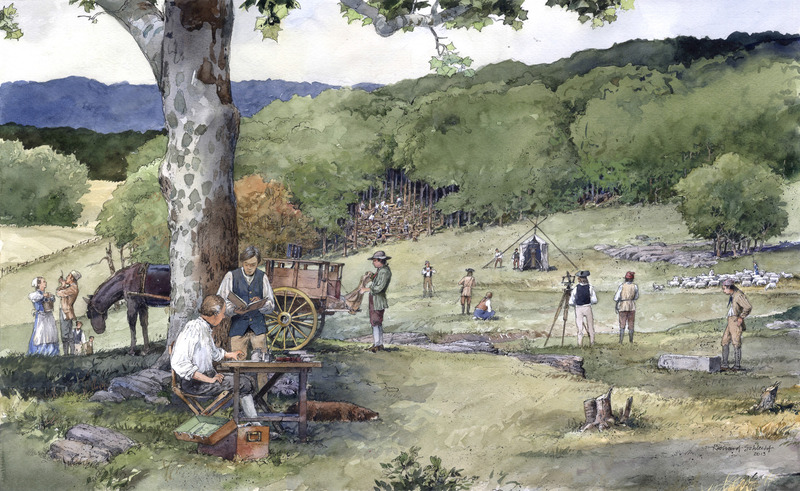 Developed, secured funds, research, wrote, illustrated 3-sided upright wayside exhibit kiosks for towns associated with Catoctin Mountain Towns and the Journey Through Hallowed Ground (Maryland Catoctin Mountain) National Scenic Byway. This included Emmitsburg and Thurmont, MD). Design and fabrication by Hopewell Industries.